If you lived in Devonshire, England around the turn of the century, you ordered the finest cabinetry available from John Gould, woodworker and tenant farmer to Lady Gertrude Roe. 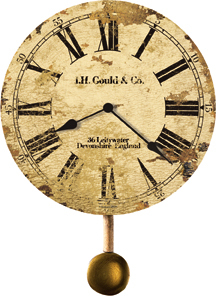 This Moment In Time clock offers an authentic facsimile of the wall clock that tracked the long hours John kept -- and helps recapture a past which celebrates the timeless essence of Old World craftsmanship. Antique dials are carefully mounted on laser cut, 1/4" thick, panel bases and feature antique black hands and a quartz movement.